There are few flavor combinations that are more delicious and comforting than coconut and basil. I swear they were meant to go together. Tropical, sweet coconut paired with fresh and cool basil?! It's like a trip to the Bahamas in your mouth! So good. This "Coconut-Basil Cream Pudding" is delicious as a breakfast addition, as well as a dessert or snack! It's great anytime of day! Quick, easy, and packed with high quality plantbased protein. Whip some of this up and you will NEVER go back to those gross, chemical-laden "Jello" Pudding Cups. Eww. 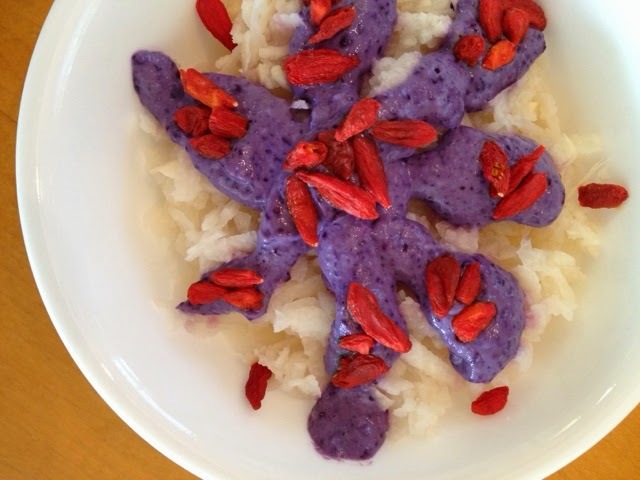 I made this dreamy dish with my treasured "Sweetleaf" brand coconut-flavored liquid stevia. You all know my utter OBSESSION with my beloved stevia. Since I am SOS-free, it's the only sweetener I use on a regular basis (I VERY RARELY use agave and molasses-only when I need the sticky consistency for a recipe). I am especially crazy in love with Sweetleaf brand. It is the ONLY brand of stevia I have tried that does not lend a bitter aftertaste. Also, they don't add any gross preservatives. IT'S JUST PURE STEVIA! Now that's what I'm talking about! 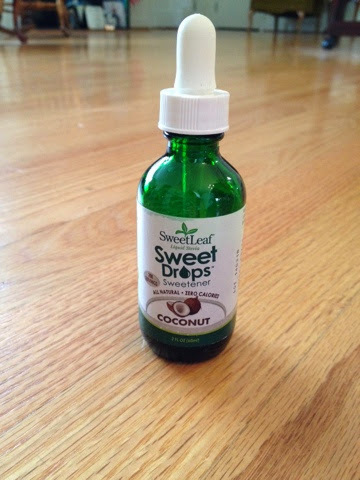 Sweetleaf is the bomb--It's the only stevia brand I use! 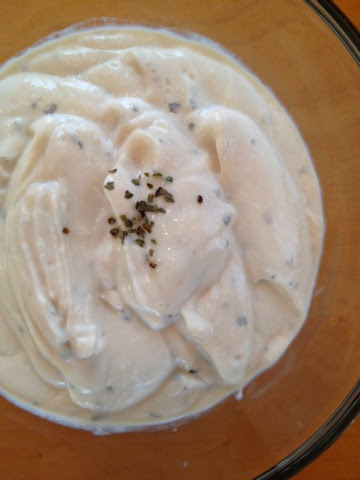 Coconut-Basil Cream Pudding; Vegan, Gluten-free. Serves one. 1. 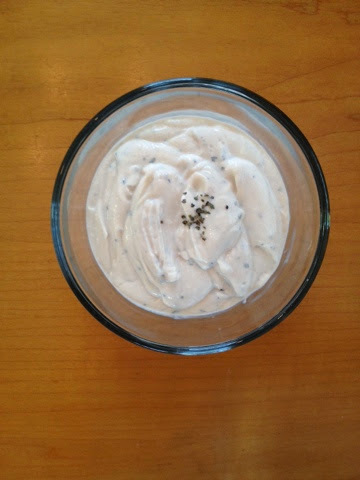 Combine all ingredients in your kink food processor and blend until super duper smooth and dreamy looking. Transfer into bowl and top with a sprinkle of dried basil for garnish. Serve! Note: I mixed in about 1/4 cup of ground flaxseed to my pudding for some substance. It was delicious! Highly recommend. Around the World Mega Salad. If you all follow me on Instagram (@thefitveganginger--follow me! Hehe!) you will know my utter OBSESSION with giant salads...I have lovingly termed these gigantic veggie piles "Mega Salads". I've posted a few of my past fave mega salads on the blog, but this one tops them all. 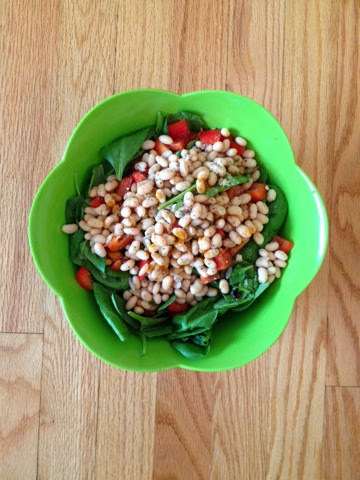 The eclectic combination of flavors really makes this salad pop. You've got crisp, tangy, spicy, fresh, and buttery all rolled into one TOTALLY BOMB dish. "Clean out the fridge salad" just became a new fave lunch. Around the World Mega Salad; Vegan, Gluten-free. Serves one (makes one GIANT salad!). 1. Place spinach in a HUGE bowl (DO NOT UNDERESTIMATE BOWL SIZE---I literally eat my salads out of a family size serving bowl...!) and too with red pepper chunks. Add beans and aminos and sprinkle on spices. Eat up! So good. What happens when you get EXTREMELY LOW on food items?! You come up with EXTREMELY STRANGE food combinations. 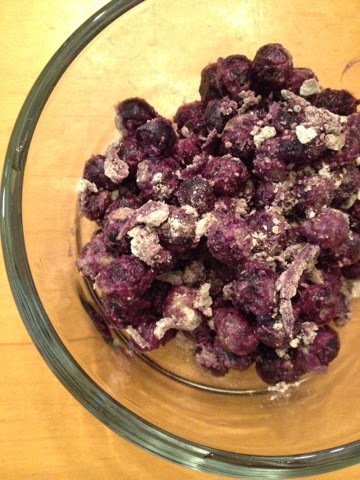 Case in point: my "Powdered Blueberries" recipe is very odd to say the least...but it's ROCKIN! So good. Super quick and easy and I'm gonna take a wild guess and say you already have all the ingredients (all TWO of them...hehe.)! Go ahead and give this one a go--you can eat them plain, use as an oatmeal topper, or even on a salad! The possibilities are endless, really! Powdered Blueberries! ; Vegan, Gluten-free. Serves one. 1. Put your frozen bloobs in a strainer and rinse briefly under cold water. Drain and place in a small bowl. 2. Sprinkle protein powder over top and mix well. Use as desired or just DEVOUR! With all my recipe creating for my new cookbook (hopefully debuting in 2016! ), my blog recipes have unfortunately taken a back seat. But this is a quick meal addition or snack that I created on a rushed morning! Super simple (as always!) and super delish (also as always!). The veggies used for the filling are very versatile and even optional. Get creative! Peanut Butter Sushi Rollup! ; Vegan, Gluten-free. Serves one. 1. 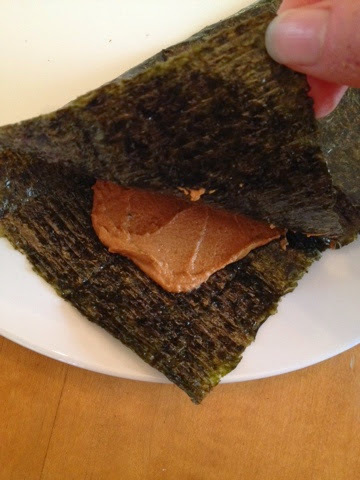 Lay nori sheet out flat on a plate. In a small bowl, mix peanut butter and ginger. Spread over nori. 2. Top with veggies and roll up like sushi. Slice and serve with liquid aminos, if using. Enjoy! You will....! Red White and Blue: Independence Day Jicama Slaw. Ok here's the situation: family picnic tomorrow. With the EXTENDED family (gulp). You have been volunteered to bring the side dish. Double gulp. You want to impress, considering the WHOLE fam will be there. It's the day before and you have absolutely no clue what to make. Before you run to your computer to perform a mad google search for vegan potato salad recipes, give my "Independence Day Jicama Cole Slaw" a go. Anything but traditional, anything but boring. This winner is sure to impress even your grumpy old Uncle Al. Independence Day Jicama Cole Slaw. 1. Place your shredded jicama in a serving bowl and set aside. 2. In your mini food processor, combine tofu, thawed berries, and stevia. Blend until super smooth. I ended up adding about 1 T of water as I blended to thin it out a bit. 3. 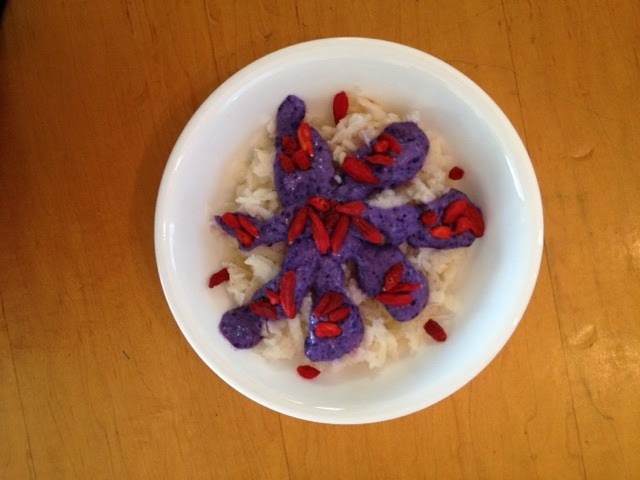 Drop dressing over jicama and garnish with gojis. Ready, set, EAT! Holiday Oats! : 4th of July Oatmeal Parfait. Yay another holiday oats post! As you know, I'm a big sucker for holidays. I mean, after all, it's just another great excuse to spend ALL DAY in the kitchen making delicious, nourishing, and BEAUTIFUL holiday-themed vegan food! Love. This "4th of July Oatmeal Parfait" is so so so good. It's so ridiculously quick, simple, and absolutely gorgeous. Have you been searching for a yummy Independence Day breakfast or dessert? Well search no more. MAKE THIS NOW! 4th of July Oatmeal Parfait. 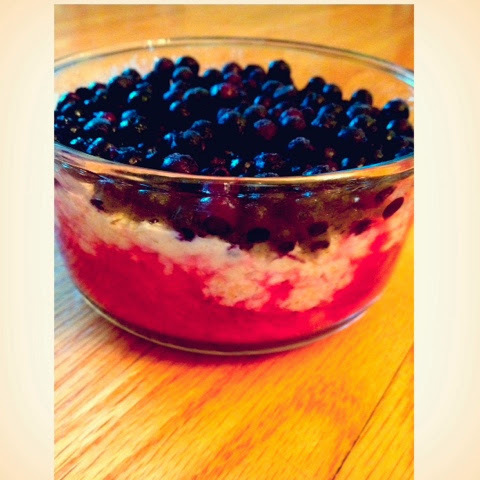 4th of July Oatmeal Parfait; Vegan, Gluten-free. Serves one. 1. Gather a glass "parfait" bowl and set aside. 2. In a separate microwave safe bowl, nuke frozen strawberries in the microwave for 40-45 seconds. Remove from microwave and mash with the back of a fork. It's ok to have some chunks remaining--don't completely purée. 3. Spread strawberry mixture on bottom of parfait dish. Set aside. 4. 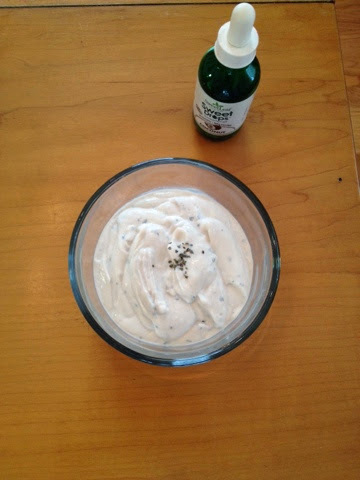 In your mini food processor, combine tofu and stevia. Blend until smooth. 5. In separate bowl, mix together oats, tofu pudding, and optional coconut. Mix well and spread evenly over strawberry base. 5. Top with frozen wild blueberries. Refrigerate until ready to enjoy. Carob Mousse with Goji Berries. This is a nice and quick meals or snack that is full of flavor. Since my oven is still broken, I've been having to make other plans as far as food! But I'm glad I discovered this gem...it's great! Enjoy! 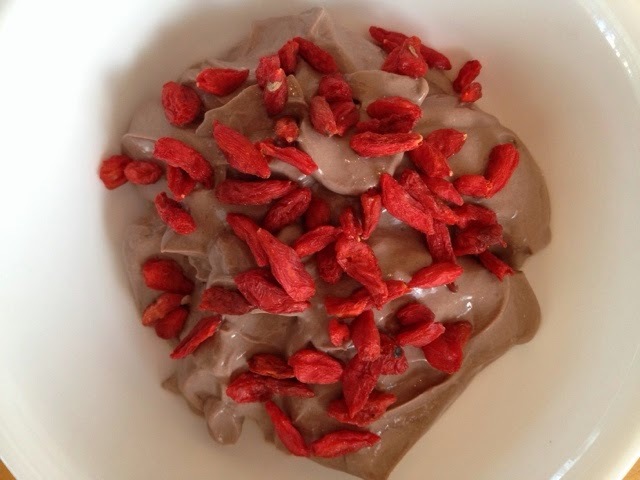 Carob Mousse with Goji Berries; Vegan, Gluten-free. Serves one. 1. 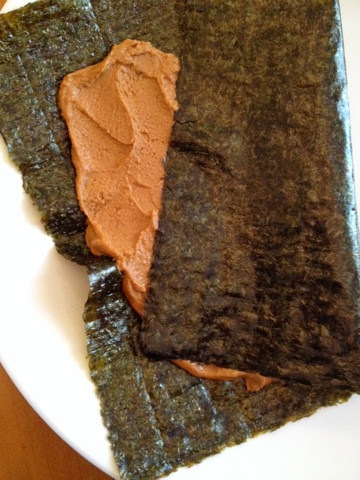 In your mini food processor, combine tofu, carob, and stevia. Blend until smooth. Transfer to bowl and sprinkle with gojis. Enjoy!